Brace yourself for the latest pop-up to completely dominate your social media feeds. 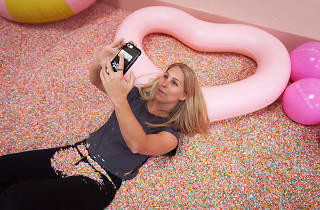 The Museum of Ice Cream has arrived in Los Angeles, with 10 colorful themed installations spread across an airy warehouse space. You'll find the New York export at 2018 East 7th Place in the Arts District. Find out more about it in our first look. The Museum of Ice Cream is adorable. It is a bit expensive considering it only takes about an hour to get through it. Don't expect to learn anything about ice cream, it's solely a place that has really cute, whimsical decor for pictures. A plus is you'll get to try about four different types/flavors of ice cream along the way. Outside of the museum there's an area to play games with friends. Honestly, I know haters will hate, but I had a blast at the MOIC! It loses a star only because I think $29 is a bit high of a price to pay for a museum you stay in for 2 hours tops. Still, no regrets on the experience. The workers are all sufficiently hype, which puts patron in the right mood to enjoy all the 'gram-worthy sights. Also,there are multiple ice cream samples! Though not a fan of each, I still enjoyed being able to eat my way through an art exhibit. The way the museum is run is also pretty stellar: each guest has a reserved time slot, so the museum never gets super crowded, and there's always plenty of time for photos :) My only other complaint, besides the ticket price, is the 2-minute time limit for the sprinkle pool. Yes, I understand the need for a time limit, but I definitely think something like 5 minutes would be way more reasonable. Nevertheless, it was a great way to spend a Saturday afternoon. Where have you been all my life? When I heard about the Museum of Ice Cream in New York I hoped that it would make its way to Los Angeles. I guess sometimes wishes do come true. This is a great place to go with your best friends, your significant other and is kid-friendly. The best part is that you get to eat sweet treats along the way. Definitely get your outfits coordinated and photoshoot ready. You will have perfectly curated Instagram posts for days. The word “museum” is really a stretch of a description for this place. If you come to the Museum of Ice Cream hoping to learn anything about ice cream, you’ll be disappointed. But if you are going for great Instagram photos and to taste different treats in the ice cream family, you’ll have a blast! The bright colored walls and interactive exhibits are perfect for a fun afternoon out and about. Be aware: you’re only allowed 2 minutes in the infamous sprinkle pool. It’s also a shoe free zone, so be sure to wear socks! Don’t leave without trying the mint chip mochi, located in the mint chocolate chip room. With continuously sold out tickets, you’re guaranteed a crowd no matter when you go so take your time and savor each room! Tickets sell out fast but if you can get over to the museum of ice cream, it was spectacular! Lots of tastings, amazing photo ops, cute pink rooms with lots of different designs and props. It was such a fun time! I've been looking forward to enjoying the Museum of Ice Cream ever since getting the advance tickets. 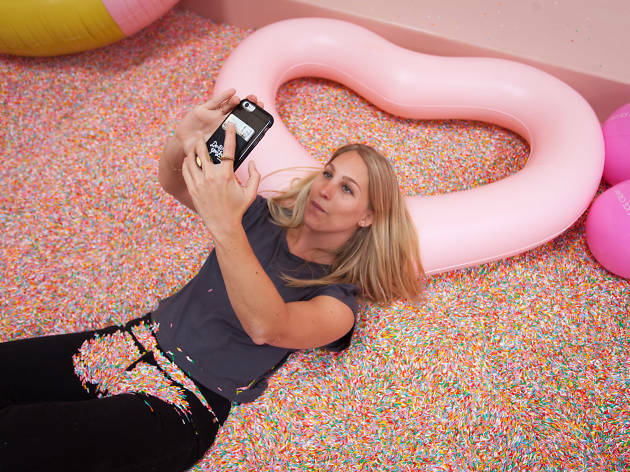 These fully Instagrammable art installations across a vast warehouse awaken all the pink and pastel colored Willy Wonka-esque icre cream fantasies one could ever have. The audience included kids and adults, all age groups equally exciting. The exhiibits seem to grow in excitement level with peak excitement reached at the sprinkles pool. The sprinkles are made of antimicrobial plastic and even those most germaphobic probably could not resist diving in! Treats are served throughout the experience, which is a great idea. However, nothing really impressed or satisfied the ice cream cravings. The lineup of treats possibly changes throughout the duration of the pop up exhibit. The staff dress in cute, strawberry ice cream colors and are quite enthusiastic. Overall, this is a can't miss experience.